Gold Star Mother's Day is a United States national observance which falls on the last Sunday in September. It honors mothers who lost sons or daughters in the line of duty of the U. S. Armed Forces. The American Gold Star Mothers, Inc. is an organization that was formed to provide support for mothers who lost children in the war. It was founded by Grace Darling Seibold of Washington, D.C. after World War I. 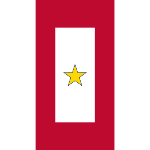 The organization was named after the Gold Star on the Service Flag that is displayed in honor of those who have given their lives for the nation. As of 2014, the Gold Star Mothers has more than 900 members. Non-citizens had non been accepted until 2005. The last Sunday in September was designated as Gold Star Mother's Day in 1936. It is a national observance mentioned in Title 36 of the United States Code. However, it is not a public holiday therefore public life is not affected on this day. On Gold Star Mother's Day, various events are organized to honor those who died while serving their nation in times of war or conflict. Government buildings are required to display the nation's flag and individuals are encouraged to do so. In 2012, President Barack Obama rededicated this day as “Gold Star Mother's and Family's Day”.